It's time for another edition of Betcha Can't Play This! 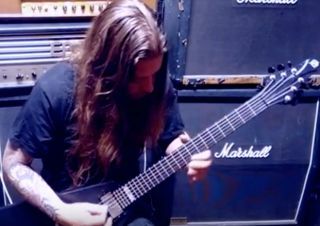 In this edition, Entombed A.D. Guitarist Nico Elgstrand gives us a brief but tantalizing glimpse of his string-melting shredding chops. Today, GuitarWorld.com presents the exclusive premiere of Entombed A.D.'s playthrough video for their new single, "Dead Dawn."